This video has not been overdubbed, that bird is really making those sounds. 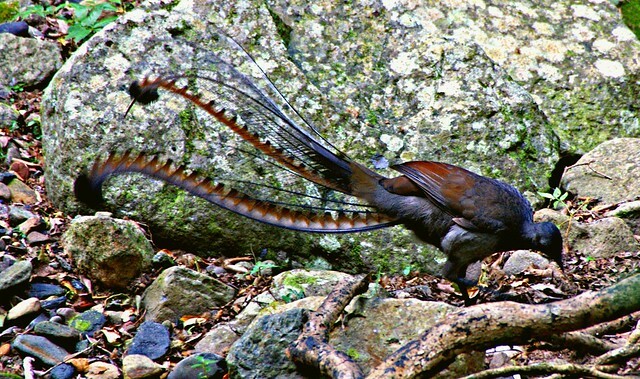 The Lyrebird is an Australian bird that has a knack for imitation. This little guy is from The Adelaide Zoo in south Australia. In addition to faithfully copying the calls of other birds, including the complex & ostentatious sounds made by its neighbor the Kookaburra, Lyrebirds also replicate other sounds they hear in their environment such as constructions noises and the click of a camera shutter. During the early 1930s, a male lyrebird, called “James”, formed a close bond with a human being, Mrs. Wilkinson, after she had been offering food to him over a period of time. James would perform his courtship dance for her […] James’s performance lasted for forty-three minutes, [and included] the calls of an Australian Magpie, and a young magpie being fed by a parent-bird, an Eastern Whipbird, a Bellbird, a complete laughing-song of a Kookaburra, two Kookaburras laughing in unison, a Yellow-tailed Black-cockatoo, a Gang-gang Cockatoo, an Eastern Rosella, a Pied Butcherbird, a Wattle-bird, a Grey Shrike-thrush, a Thornbill, a White-browed Scrubwren, a Striated Pardalote, a Starling, a Yellow Robin, a Golden Whistler, a flock of parrots whistling in flight, the Crimson Rosella, several other birds whose notes his audience were not able to identify, and the song of honey-eaters (tiny birds with tiny voices), that gather in numbers and “cheep” and twitter in a multitudinous sweet whispering. [Also] perfect mimicry of the sounds made by a rock-crusher at work, a hydraulic ram, and the tooting of motor-horns. From Wikipedia I also learned that A group of Lyrebirds is called a musket which is too awesome for words.